Polycotton twill patches suitable for decorating and mending most fabrics. Strong and easy to apply. Pack of two 10cm x 15cm patches. 3 x Light Denim, 3 x Mid Denim and 3 x Dark Denim (9 patches). 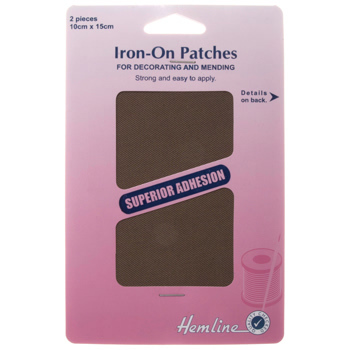 Handy mini size patches, 7.5cm x 5cm, for quick multi-use repairs. Strong and easy to apply. 6 assorted colours (10 patches): Black x 2, Grey x 2, Navy x 2, White x 2, Brown x 1 and Fawn x 1. 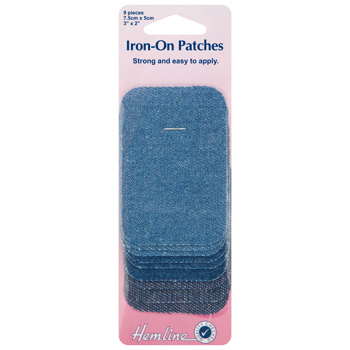 Handy mini size patches, 7.5cm x 5cm, for quick multi-use repairs. Strong and easy to apply.